As a member of the Iowa Engineering Society, your UPS rates have just gotten better. Through our partnership with UPS, you have exclusive access to the UPS Savings Program which provides great discounts on UPS domestic air, ground and international services. To begin saving up to 30% on these services, CLICK ON THE LINK BELOW for more information on how to enroll. IES members can save up to 30% off UPS Express air and international shipments. That’s a significant savings over FedEx published rates! * All this with the peace of mind that comes from using the carrier that delivers outstanding reliability, greater speed, more service, and innovative technology. UPS guarantees delivery of more packages around the world than anyone, and delivers more packages overnight on time in the US than any other carrier, including FedEx. 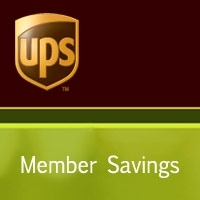 Members already enrolled in the UPS Savings Program must re-enroll to take advantage of this new exclusive offer. UPS is the first nationwide retailer to test 3D printing services in-store. Just a reminder of what all UPS can offer and how you can take advantage of discounts with UPS.